All-day beverages, refreshed as needed. Hot Coffee and Tea station. Bottled Spring Water, St. Croix sparking water. $4.50 per person, includes Coke, Diet Coke, St. Croix, etc. DIGITAL HD Projector, images are 19-ft wide x 10'ft high. Professional sound system, four speakers available. Sound System can be accessed via Wi-Fi. Welcome to this Clean. Dynamic. Professional loft space in the best neighborhood in Manhattan. 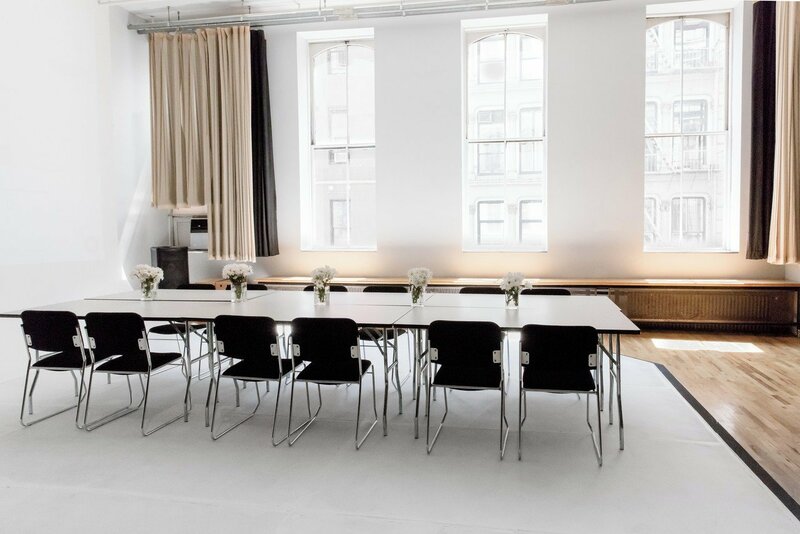 You will feel right at ease when you book this sunny spacious loft space in NYC used for company meetings, workshops, and presentations. 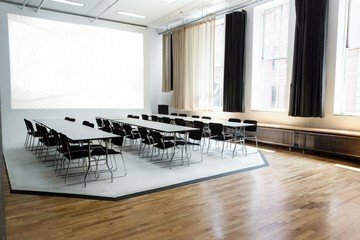 Centrally located in Union Square-Flatiron district, this private space is an inviting, creative place to meet with 16’ ceiling and huge 12’ windows. You will meet in complete privacy without any interruptions or distractions In this 2500-sq ft room. Fit up to 55 people in round table seating, 28 in horseshoe style, 34 classroom style, 75 theater style, 80 banquet style, or 150 for a standing cocktail event. 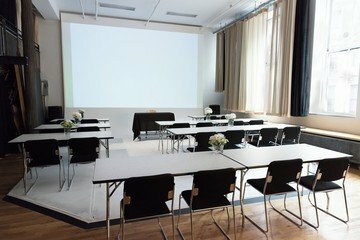 It is a perfect venue for companies looking for a big room, to host a team event for a large group of people or for an intimate board meeting in the heart of NYC. The room will be customized with furniture to fit your vision. Staff is on standby to assist with technical questions and to provide unlimited beverages all day. The all-inclusive package pricing is for a meeting up to 50 guests. Outside catering is welcome. All day hot coffee/tea, bottled spring water, assorted organic milk and plant-based creamers is included. Furniture up to 50 persons is included, additional guests are $20 each to cover beverage and furniture. There is an open kitchen and 2 stainless steel 6’ tables available for catering. Security deposit $1000 required. 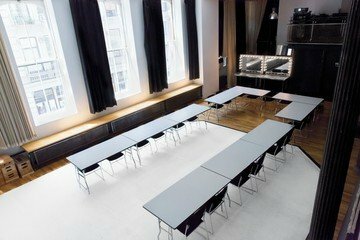 Regarding equipment and amenities, the New York city loft offers a professional sound system, a stationary digital HD projector (19-ft x 11.5 ft images), one wireless microphone, two bathrooms, coat racks with hangers and the cleaning fee is included. The loft is a PRIVATE space with two secure high-speed fiber optic Wi-Fi networks and is equipped with 100 Amps 5-Wire, 3 Phase Electric. 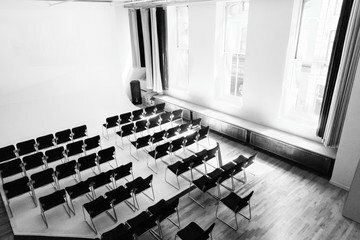 The large wide-screen projection and surround sound provide an immersive experience as your presentation will fill a 2-story screen. You also have access to a unique 2nd level space overlooking the main floor. The mezzanine is perfect as an additional breakout space. This historic building was built in 1868, this loft was renovated to its present design in 1999. Union Square is a vibrant neighborhood centrally located in NYC. The Green Market, retail shops, gourmet dining and lively bars, and public transportation are all nearby. The closest subway stations have lines 1, 2, 3, N, R, Q, 4, 5 and 6. Hotels nearby include the Gramercy Park Hotel and W Union Square and many more. 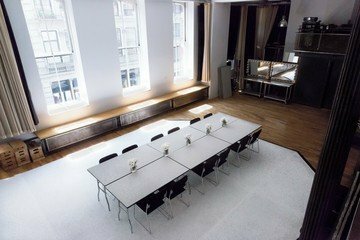 Make sure you don’t miss out on this unique venue, where companies such as Spotify, Twitter, American Express, Unilever, L’Oreal, Grey Goose Vodka and Tom Ford conduct successful meetings. 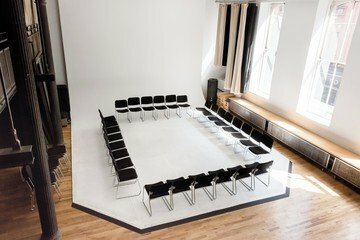 Meet in a space that also serves as a photo studio for celebrities such as Beyonce, Spike Lee, Lady Gaga, Fifty Cent and Alicia Keyes.